But what is encouraging is the increased willingness of the ordinary Singaporeans of daring to openly criticize the Prime Minister and his ruling party the PAP, something which was unheard of in the past in that tightly controlled one party state which relied on fear, it's only tool to keep the island citizens subjected and obedient. 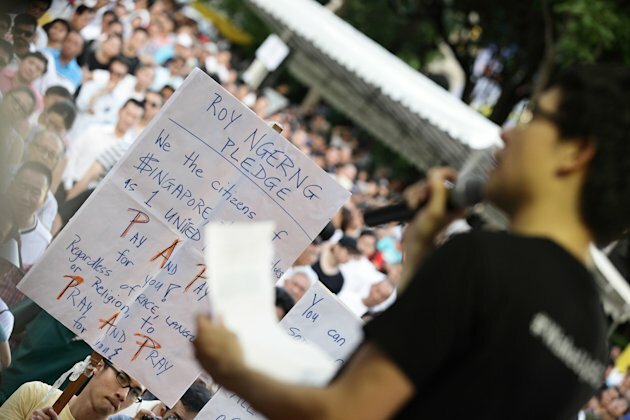 Here are pictures of the protesters with signs openly criticizing the Prime Minister and his ruling party at the protest at Hong Lim Park on June 7, 2014. The Singapore Prime Minister is clearly in trouble. The island has no human rights, no right to protest anywhere other than at Hong Lim Park, no free speech, expression or assembly, no rule of law and no free press. In an island increasingly becoming educated and Internet savvy, the only way the Prime Minister has retained power is through fear and repression. Fear was his principle tool so far to retain control. From all appearances, it appears Singaporeans are slowly coming out of that fear and prepared to openly show dissent despite the certain dangers of government reprisals and repression. This is a dangerous sign the Prime Minister better start worrying about. His mistake was allowing peaceful protests at Hong Lim Park in the first place, when previously all protests throughout the island was banned. 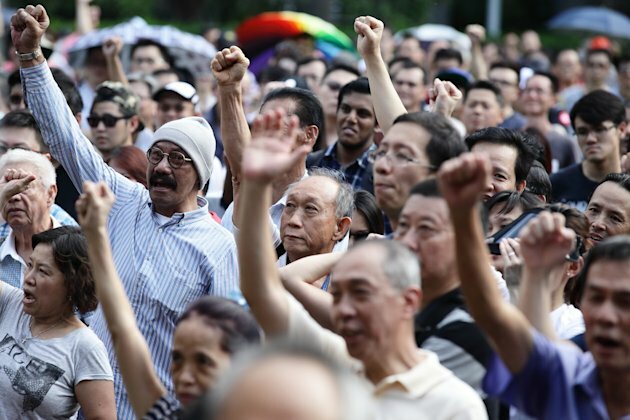 By allowing these protests at Hong Lim Park, Singaporeans who are becoming increasingly frustrated at their lot of life in this one party police state have finally decided to break free of their fear under which they suffered throughout the history of Singapore. The Prime Minister has a choice. 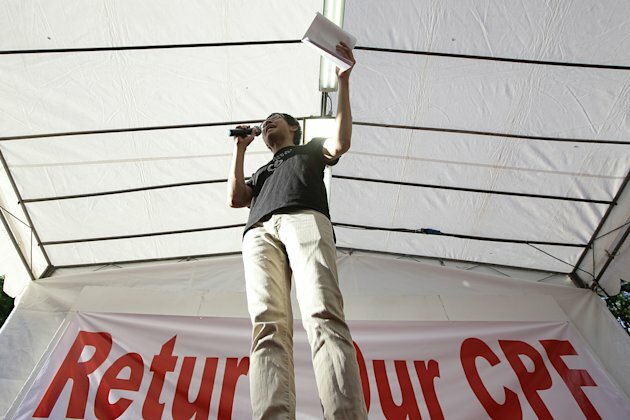 He has to either to rescind the right to protest at Hong Lim Park, nipping the bud of freedom in time, and hope to retain control a while longer. If his does this he would be even more hated by his people than he already is. On the other hand if he continues to allow these protests, they are going to become more and more frequent and their citizens becoming even more vocal in expressing their anger at his government. Either way he does not have a chance. He is simply doomed. The protest culture which was non existent in the past, through their all consuming fear, has clearly taken root. The tempest has been let loose from the bottle. The wind and fire of freedom is raging. The Prime Ministers' days are clearly numbered. The writing of change is on the wall. It certainly doesn't look good for him now. After all what did he expect? Rule Singapore through fear forever? If his first wife committed suicide, then he might do likewise. I understand that many printers refused to print the protest posters which explained the numerous handwritten protest signs at the rally. SACRAMENTO — California's huge pension fund reported a 16.2% return on its investments in 2013. The California Public Employees' Retirement System, which provides benefits to about 1.7 million state and local government workers, retirees and their dependents. Full transparency - members and the public can get full disclosure on investments, performance and fees paid. 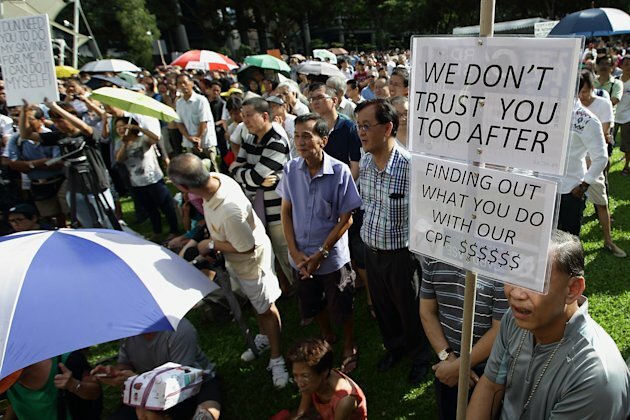 Why does Singapore's CPF only return 2.5%??? - Actually makes 16% (per Temasek) but the money is siphoned off? To where? Whom? Inquiring minds want to know. Will the Lee's let us in on their secret?